An essential step in deciding to have knee replacement surgery is talking to your healthcare provider about your needs, wants, and goals. Researching the technology used in surgery, being informed about your knees, and rehabilitation is also important. We have provided all the information for you here. Part of our commitment to excellence in progressive healthcare is the use of robotics in our rural community. 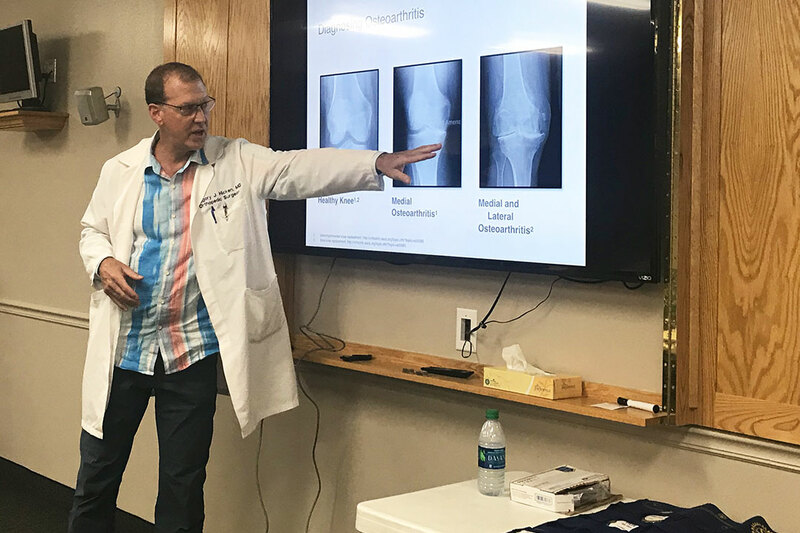 Patients will also continue to receive a continuum of care that FCMC is known for throughout Cache Valley; from your referring physician to the orthopedic surgeon that performs the replacement, all the way through your rehabilitation and recovery. The NAVIO◊ Surgical System: Accuracy. Precision. Confidence. Recent advances in biomedical engineering software have opened a new chapter in high performance knee implants. One remarkable breakthrough has been the creation of the JOURNEY II XR Active Knee System, which combines an implant designed to restore the stability and natural motion of the human knee with low-friction materials that may help extend the longevity of the implant itself. While the longevity of a knee implant is heavily influenced by the materials used to make it, the natural feeling of the implant during physical activity is dependent upon the way the patient's muscles, ligaments and tendons are addressed during surgery and by the implant's shape within the body after surgery. Every knee implant design is faced with two important challenges; how to recreate the normal swing-and-rotate motion of your natural knee, and how to restore stability to your joint after surgery. For the first challenge, conventional knee implant designs have attempted to recreate the natural, fluid motion of the knee with either a rotating platform (a simple pivot point) within the implant or by requiring an angled alignment of the implant during surgery. Both of these options force the muscles around your knew joint to work harder as they adjust to the joint's new and unnatural shapes and movement patterns. For the second challenge, most implants rely on design aspects within the plastic insert to provide the stability that is sacrificed after the anterior and posterior cruciate ligaments (ACL/PCL) within your joint are removed to accommodate the new implant. Fortunately, the JOURNEY II XR Knee Implant is different from most knee implants. First, the JOURNEY II XR implant features an anatomically shaped femoral component and two plastic inserts designed to work together to reproduce the original internal shapes and forces of your natural knee as it goes through its full range of motion. This attention to anatomic detail means that the muscles and other soft tissues around your joint don't have to adjust to unfamiliar stresses and you may be able to return to a natural pattern of motion after surgery. Second, the JOURNEY II XR uses a U-shaped tibial base plate that fits around your healthy ACL and PCL, allowing them to remain in place and function normally after surgery. In short, the function of these important ligaments doesn't have to be re-engineered because they were never removed. The JOURNEY II XR implant addresses durability with VERILAST◊ Technology, a combination of two wear reducing materials - the proprietary OXINIUM◊ metal alloy and a highly cross-linked plastic insert - that were designed to address wear on both surfaces of the implant. VERILAST Technology was designed to address "wear and tear," which is only one of several reasons why a knee implant may need to be replaced. Each patient should listen carefully when his or her orthopedic surgeon reviews other risks that can shorten the life of a new knee - such as infection, weight gain or high impact sports. Not all patients are candidates for the JOURNEY II XR Knee Implant. Discuss your condition and implant options with your surgeon. Knee Surgery - What is the Right Age for Surgery? You may be wearing elastic hose, and/or a compression stocking sleeve designed to minimize the risks of blood clots. Your doctor may prescribe a PCA (patient-controlled analgesia) that is connected to your IV. The unit is set to deliver a small, controlled flow of pain medication and is enacted when you firmly press the button on your machine. Press the button anytime you are having pain. You may have a catheter inserted into your bladder as the side effects of anesthesia often make it difficult to urinate. A continuous passive motion (CPM) unit may be placed on your leg to slowly and gently bend and straighten your knee. This device is important for quickly regaining your knee range of motion. When your leg is not in the CPM, you may be wearing a knee immobilizer to protect your knee when you stand up. Deep breathing exercises: A simple analogy to illustrate proper deep breathing is to, "smell the roses and blow out the candles." In other words, inhale through your nose, and exhale through your mouth at a slow and controlled rate.